Hi there, First time writer. I am new to the hobby and love it! I have a 29gallon biocube. I have been doing this for about three months now. The tank was set up for two years before I bought it. I have Ocellaris Clownfish, Yellow Watchman Goby, Purple Firefish, and Kaudern's Cardinal fish. I have a few pieces of lps, sps, and one small toadstool leather. Everything is healthy, but has seemed stressed lately due to Nitrates. They have been running around 20ppm. I feed new life spectrum pellets and Mysis. Pellets in the morning and Mysis at night. I feed very light small pinch of pellets which they consume in about 15seconds. The Mysis I feed maybe a quarter of a cube a day. Coral feedings. I feed a small piece of a algae sheet twice a week for my snails at night and remove what is left in the morning. Normally its all gone in the Morning. I feed my corals twice a week. Kent marine ZooPlex and marine snow. I target all my corals twice a week. I do five gallon water change the next day after second feedings of corals. Ammonia 0, Nitrite 0, Calcium 420, Carbonate hardness 10dkh, Ph 8.2, and Magnesium at 1250ppm.There are three chambers in the back of the biocube. In the first chamber I have a AquaticLife Internal Mini Skimmer. It seems to do well. Fills the collection cup with nasty brown stuff every other day. the second chamber I have rock and charcoal with filter pad over the top of the rock that comes with the system. Third is my pump, uv and heater. So I have been reading all over the internet and saw a few post of people having the same problem. <Leaving out the bunk "coral foods" will highly likely solve the NO3 issue. Hi Bob, Thank you for such a fast response. So far the Cardinal fish seems stressed free and not bullied. I will keep a eye on him for sure especially as he gets older. So do I target feed the lps corals? Do I keep feeding the same amount I have been? I have tried target feeding some of the lps I have, and the Mysis seems to blow right past them. lol The only thing I seen take it well is my Duncan coral. I also do feed them at night when lights or off and tentacles are out. Are there any corals food that is good? I just fed my dogs. I always think that this is the perfect way to eat. All they need, scientifically formulated, is in a bag of dry food. They are getting a balanced diet, and it takes no time to prepare. I wish there was something like that for me that came in large bags. Instead I have to fuss and prepare a meal with no guarantee that will be balanced and complete of even taste good. If I am lazy I can eat fast food and junk food, and be worse off than my dogs. Corals are like that too, but even more complicated because the diet depends on what coral you have and are back to the same problem of getting a balanced diet they will accept. It would be so much easier to feed them like I feed my dogs. Well of course there are prepared commercial foods for corals. Looking at the products online there is Seachem zooplankton, phytoplankton and reef plus, and probably others. So the question here is whether these pre-packaged products are as good as dog food in a bag, or the equivalent of junk food. Do you really need to go back to the kitchen pull out the recipe book and come up with a properly balanced meal if you want to feed corals? I have an 80 gallon refugium with a few mushrooms, two feather dusters, and now a colony of blue anthelia with two pulsing xenias mixed in. I have been target feeding DT's Live Phytoplankton daily as well as putting in just a few spectrum TherA pellets that I feed my fish so the crabs and snails have enough to eat. My refugium is only a month or two old so this seemed necessary to build up the source of food for the clean up crew and for the algaes to have enough to work with. My question concerns my corals. I am new to the invertebrates and had absolutely no idea where to start looking for such general information. I am wondering if it would be good to make a mixture of Cyclopeeze and mysis shrimp that is finely ground in a blender with phytoplankton and garlic guard or some other additives to give them a more full diet. I have been researching live rotifers and copepods and I can assure you, after upgrading my system this coming week they will be joining my tank hopefully to reproduce and provide a live natural food source. But in the meantime would the aforementioned mixture would be good for anything in my tank? I'm Syafiq from International Islamic University Malaysia (IIUM). I'm doing a research on live rock composition. The title of my final year project is 'Study of Mineral and Element Composition of live rock in Pulau Redang and Pulau Perhentian'. I need your help in finding an information regarding the nutrient of coral. The function of each macronutrient and micronutrient involved for the growth of coral. I'm one more person, who would like to say how great and informative your site. I'm new in the hobby. My tank is 6 mo, however thanks to all your advices, everything is doing well. I read your articles almost every day. I have a question regarding LPS ID. I found it in one local fish store under name Neon Green. A salesman could not give me any additional info. 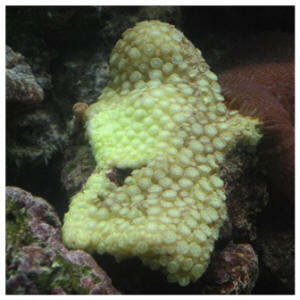 It covers a life rock, polyps a small about 3 mm in diameter and 2-3 mm tall. They retract when disturbed. Is it kind of Turbinaria? And one more question. In most of your articles you mentioned that corals eat zoo-plankton. What kind of coral eat phytoplankton? An instruction on bottles with phytoplankton says, that it is food for filter feeders and corals. Glad to see you guys are still here to help us reef geeks out. I've used you guys plenty in the past, with success, thanks to you, and need your help again. This is probably an easy question for you guys but I need to re-vamp my coral feeding schedule. Lately, my tank has been maintained, but not thriving. I have a 72 gallon reef. 2x250 MH HQI Hamilton, 1 1/2 year old reef. I have a baseball sized frogspawn and would like to you know your opinion on the best food for it. I also have some bright green Acro...doing okay...white tips and all but it's apparent I need knew <new> bulbs (on the way). The rest in the tank are a few fish and an impressive crop of macro growing from the rock. I've been using Combo Vital from Marc Weis. I've only been feeding once every 3 weeks. (target feeding) The Acro and frogspawn actively catch particles and move it to their mouth but I've also heard a few bad things about this food. Before I get more aggressive with feeding I was wondering what you think about this product. <I've tried a few of Marc's products in the past and I wasn't very impressed with the results, felt I had wasted my money. <Personally, I do not do any scheduled feeding of my corals/clams, but rely on photosynthesis and have gotten great results. Occasionally, I will feed freeze dried Cyclopeeze for the Flasher Wrasse (loves it) and I'm sure the corals capture some of this nutrition. As for the clams, I do not feed anything, again relying on photosynthesis and dissolved nutrients. Clams seem to do better when a small amount of nitrate is present in the water. Great info, thank you for the help. I understand you rely on the lighting, but if you wanted to target feed your frogspawn twice a week just for insurance ( filtration is great and nitrates are zero with Salifert test) what would you go with?. The tank is lightly stocked and has room for "extra" feeding. You said you don't like Combo Vital... I've heard good and bad. thanks for the links to the clam info. That's next on the purchase list. Have a good one! my new tank setup is almost finished and I was going to be adding a phyto producing area that feed a rotifer tank to feed my corals. I will be producing new phyto weekly and then using a drip line dripping it into a rotifer tank at a correct drip rate to keep the culture at max efficiency. My main question is that most articles I have read about rotifer feeding states to use a micron net to pull out the rotifers and feed them directly to the tank. Since I am making fresh water to feed to the phyto and only feeding the phyto to the rotifers when it is fully cultured. I will then completely feeding the phyto within a few days keeping it fresh. Why can't I use a drip line from the rotifer tank to drop straight into my main tank? I currently add phyto to my main tank at Â¼ cup a day right not and does not seem to harm it. I have a 200 gal tank with plenty of live rock/sand and a massive skimmer. I don't currently have any algae problems. Do you think the water that the rotifers live in is that dirty if I am dripping it on a timer each night at a rate of refreshing the entire 5gal tank every week or so with new phyto water? I know they have ammonia but I can't imagine that they produce more than my fish do and that my tank cant handle it.